Goodreads says, "The New York Times bestselling novel about a woman who falls in love with a man she shouldn't. Rachel is an attorney living and working in Manhattan who has always been the good girl-until her thirtieth birthday, when her best friend Darcy throws her a party. That night after too many drinks Rachel ends up in bed with Darcy's fiance. Although she wakes up determined to put the one-night fling behind her, Rachel is horrified to discover that she has genuine feelings for him. As the September wedding date nears, Rachel has to choose. She discovers that the lines between right and wrong can be blurry, endings aren't always neat, and sometimes you have to risk it all to win true happiness." Rachel is a lawyer in NYC and is the quintessential good girl. Her best friend, Darcy, is the polar opposite. She's outgoing and fun loving; plus, she is engaged to Dex, Rachel's dreamy friend from law school. Darcy loves to throw a good party and throws one for Rachel's 30th birthday, but Rachel, after too many drinks, ends up in bed with Dex. When all is said and done, Rachel realizes that she, deep down, has feelings for Dex. Now, good girl Rachel finds herself in a precarious situation where she must choose either her friendship or follow her heart even if it means hurting her best friend. 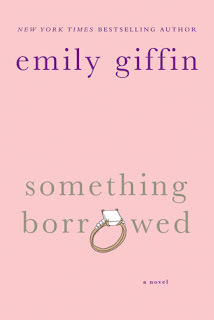 Things aren't always easy and there's always a gray area in Emily Giffin's debut novel, Something Borrowed. It's the ultimate chick-lit novel! Rachel is a character that I'm sure we can all relate to in someway. She has always done the right thing and has always been in the shadow of her effervescent best friend, Darcy. She's put her career before her social life and now finds herself single and thirty years old. Darcy, although she has a good heart deep down, is a trying character. She is a narcissist and so extremely self-absorbed. I felt bad for Darcy for a nano second and then realized that I have no clue how Rachel puts up with her crazy antics. It's always all about her and that gets old quickly. Dex is a delicious love interest in Something Borrowed and although I felt bad since he's engaged and all, I quickly forgot about that once the story unfolded. Giffin really knows how to write a situation that's tough for all involved, but I think she depicted Dex's situation within the love triangle perfectly. Simply put, Giffin gets women and takes a story where we should probably hate the protagonist and in turn, flips it on its head. 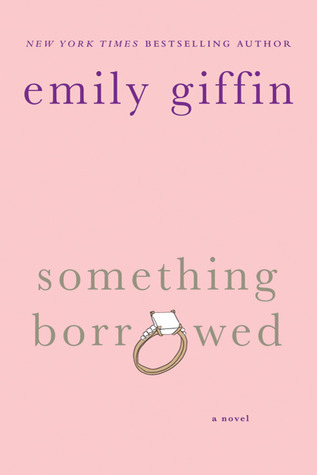 Giffin is my go to author for a beach read; it's light, it's fun, but it's smart too. And I was so happy to have the opportunity to meet her last year at a book signing. Not only is she drop dead gorgeous, she's smart and hilariously funny. I can't wait to read more of her books in the future and if you are a fan of womens' fiction and haven't read Giffin's novels, you MUST check them out now! The sequel to this book, Something Blue, is just as good! And don't forget.....you can watch the Something Borrowed movie that came out last year, which I thought was brilliantly casted and not a disappointment in the least. A. Look how cute you are! Lucky duck! B. That's the mark of real talent. When an author can turn someone I hate into someone I care or sympathize for. I have never read any of her books! I have 3 on my shelf but I've never gotten to them. I think I'll need to fix this soon. I really want to watch the movie, but maybe I should get and read the book first. Yeah, I think I should do that first. Thanks for the review! I have been wanting to pick this book up for awhile now, I've heard some good things. I was given the second one by a friend but can't read it because I haven't got the first one yet! I have this one on DVD. I'm saving it for a girly night in. I really like the sound of the book too, so must check it out. I also really liked this book and I hope to buy the movie once it comes out on DVD. Great review! JuJu- :) Thanks! I felt like such a nerd in my argyle teacher shirt. She was so glamorous compared to me. Thanks for checking out my review. Mrs Q- You must take time to read her books. They are deliciously fun! Nina- Definitely read the book first- can't wait to hear what you think of both the movie and book. Enjoy! Jenny- It definitely is the perfect combination. Thanks for visiting. Andrea- I hope you get to read it soon! The second book is just as good. Thanks for visiting. Leanna- The movie is perfect for a girls night in. I can't wait to hear your thoughts on it! Kate- Isn't it such a fun read? Can't wait to hear what you think of the movie once you get to see it- let me know! This is a book that I enjoyed and it really surprised me that I did. I was just not a fan of Dex. I thought he should have done more.